SURF CAMP MOROCCO – Winter is coming, Morocco is calling! When it’s time to wear warm jackets, turn the heating on, and drink hot tea instead of icy water… When the days get shorter and the weather less pleasant…Then, my dear friends, it’s time for Surf Camp Morocco! Morocco’s on fire during the winter months. Get ready for big swells and 20+ degree weather. Believe us when we say, you’ll want to hibernate here! 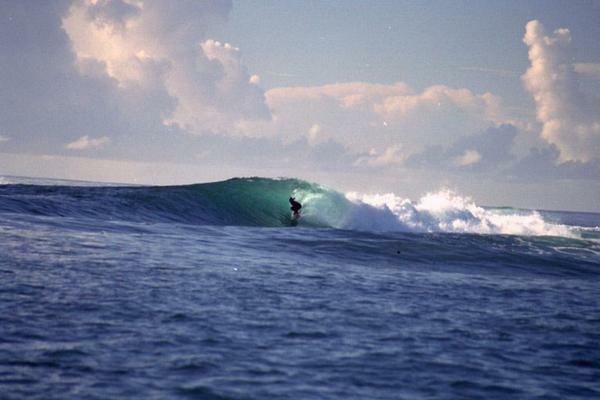 Nearby our Moroccan Surf Camp are the surf spots Killer Point, Hash Point and Banana Point. Evidently, Moroccans aren’t lacking in humour! They’re also not lacking in good waves, good weather, and a good lifestyle! 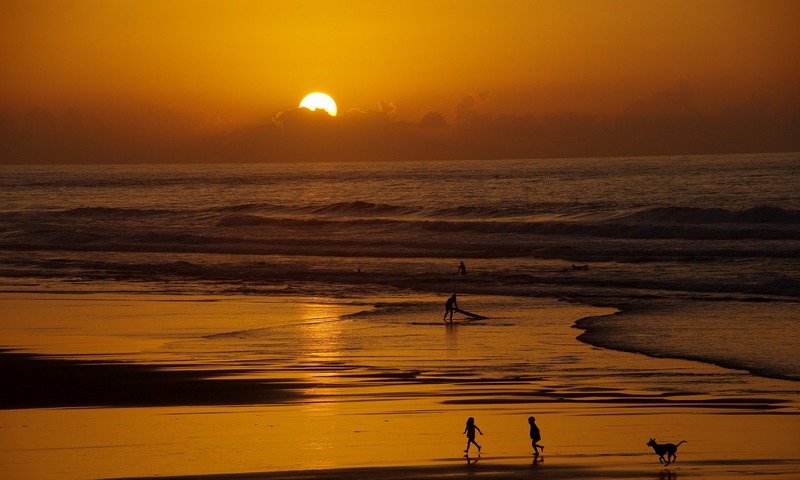 You will just love Surf Camp Morocco! Surfing in Morocco - The Best Regions and SpotsTravel Time, Flight and Transfer on SiteHistory of Surfing in MoroccoSurf Events in MoroccoThe Moroccan CultureWeather, Climate and Water TemperatureFood in MoroccoTop 10 Morocco HighlightsWhy Morocco with Planet Surfcamps? Surf Camp Morocco is a surf dream come true. Especially, if you know where to find the best surf on the 1835 km² long coast. The surf epicenter is located in central West Morocco between Essaouira and Agadír which makes the spots easily reachable from Marrakesh, the biggest city around. 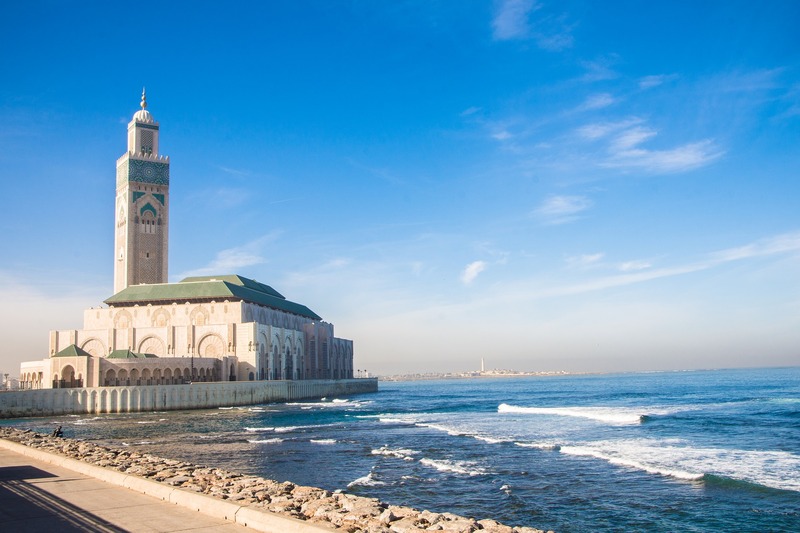 Morocco’s biggest city is Casablanca in the Northern part of the country. Although the South is more popular among surf travelers, you should make the mistake to only orient yourself towards south. Particularly in September, the vivid city is an attraction for surf travelers because the WSL comes in town to host a competition. At good conditions you will have a sick surf but for the real surf vibes you should head south sooner or later. Many nice and easy accessible spots are in close proximity to the beautiful harbor city Essaouira. The spot is in the north of Essaouira. The two hours ride is definitely worth it if you’re an experienced surfer and also if you just want to watch the pros on the water. Surfing can be quite dangerous here. Safi Rass Léfaa is a beach break with flat rocks right underneath the surface. The rides here are long, fast and fun. Next door is the spot Garden that works only with a big swell from west. When the wind comes from the east and the tide is low you will see a lot of surfers in the cleanest barrel of their life. The swell range is 3 – 15 feet. In contrast to Safi, the surf spot in the bay of Essaouira is cute like a kitten. Because of a small offshore islands, the swell isn’t able to roll on the beach at full power. These circumstances make Essaouira a perfect place to learn surfing. Also kite surfers and wind surfers have a lot of fun here all year long. But don’t worry: At nice conditions, therefore swell from the north-west and wind in the opposite direction, you can witness some left and right steam hammers. We’re in Morocco after all. The best thing about it: The spot is pretty empty. Only the beach is crowded with locals who play football, make music or sell drugs (which can be very annoying). Another very important spot in this area is Sidi Kaouki. It’s located 30 kilometers away from Essaouira at the edge of a calm village. Sidi Kaouki is suitable for all levels. The beach break offers incredibly long waves on good days. You can count on sweet sessions while you’re here because the spot works consistently and at every tide. The swell range is 1 – 6 feet. Near the old fisher village Taghazout and north of Agadír, some of the best spots in Morocco are located here. However, the fewest are suitable for beginners. As a surf student living in a surf camp, you get the chance to ride some waves right in the village Taghazout. Further north instead you should have something on the ball already. The swell on every spot in this area comes from north or north-east and rolls down the coast. No fear! The spot isn’t called Killer Point because of people dying like flies in the reef break. 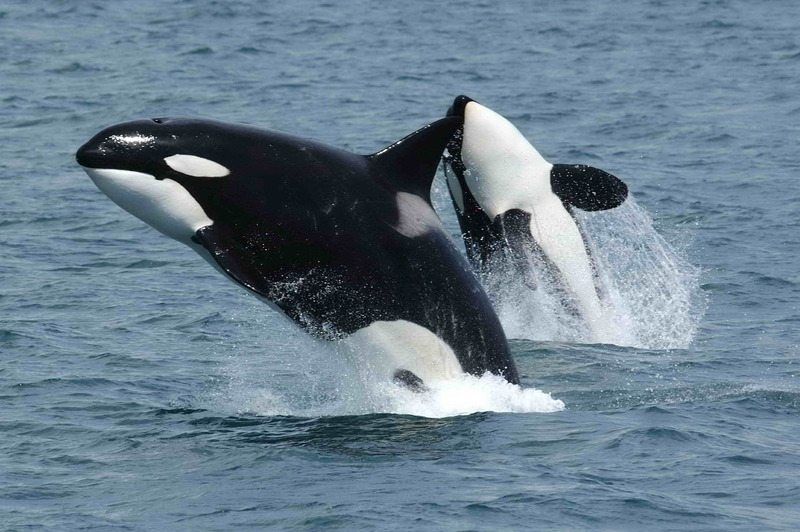 Killer Point got his name because of the killer whale family that drops by time after time and is more harmless than dangerous. The spot itself offers unbelievable waves and empty line-ups. Killer Point works at almost every swell and wind direction but you should come here only at low tide. 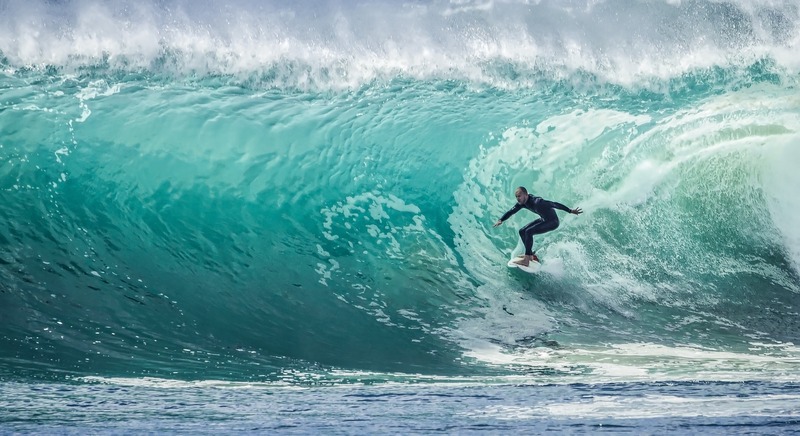 The right wave can reach up to two meters height. On the way south you should stop over at the spot ‘La Source’ which shows similar characteristics like Killer Point. Mid and high tide works here nicely so it’s the perfect alternative when Killers isn’t working. The line-up is thinner during the week. We’re still north of Agadír which exhibits the unbelievable density of world class surf spots in this region. Anchor Point is also a point break with a right wave. The best swell comes from north or north-west and the wind from east or south-east. The break starts working at 3 feet and goes up to 16 feet and more. You can surf at any tides and on top of that pretty alone. 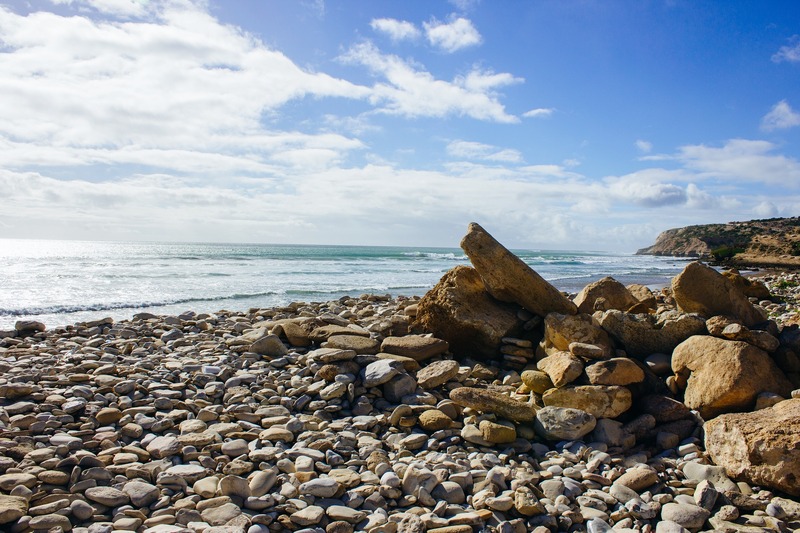 Mysteries, Hash Point and Panoramas are the evocative spot names right at the beach of Taghazout. Mysteries is situated in the northern part of the village whereas Hash Point and Panoramas are further south. Every spot here is a reef break and works best at a northern or north-western swell. Taghazout’s spots are suited for all levels in contrast to the spots further north. Mysteries invites you to endlessly long rides in wintertime. Banana makes everyone happy. The spot is named after the nearby banana plantation. Surfers at all kinds of surf experience can have fun sessions here. Especially longboarders love this spot. A wave can run up to 300 meters. The wave’s quality ensures that the line-up is full when the conditions are great. The best swell arrives from north and north-west. The wind should come from the south or south-east. Regularly, the waves are smaller compared to other spots around. This can change very quickly. As we already mentioned in the intro, Surf Camp Morocco is a winter destination. You’re gonna have the better surf conditions and less tourism at this time of the year. On site, there are lots of opportunities to get from A to B. Certainly, an own car gives the ultimate feeling. Morocco is a cheap country compared to European prizes. Therefore, renting a car is absolutely affordable. The cheapest way is probably taking the buses that obviously offer less luxury than an own car. The Moroccan road network is pretty manageable and the few roads are in good condition most of the time. 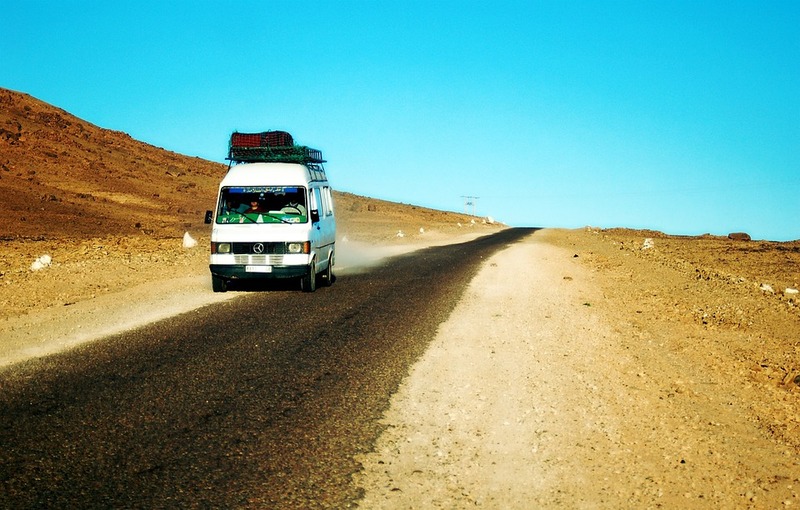 Whatever vehicle you choose – you will find Surf Camp Morocco for sure! According to narratives, the first surf board came to Morocco in the 50s because the US military was based in the north. The foundation of the longstanding surf culture in Morocco was laid by a group of Frenchmen who were also housed there. 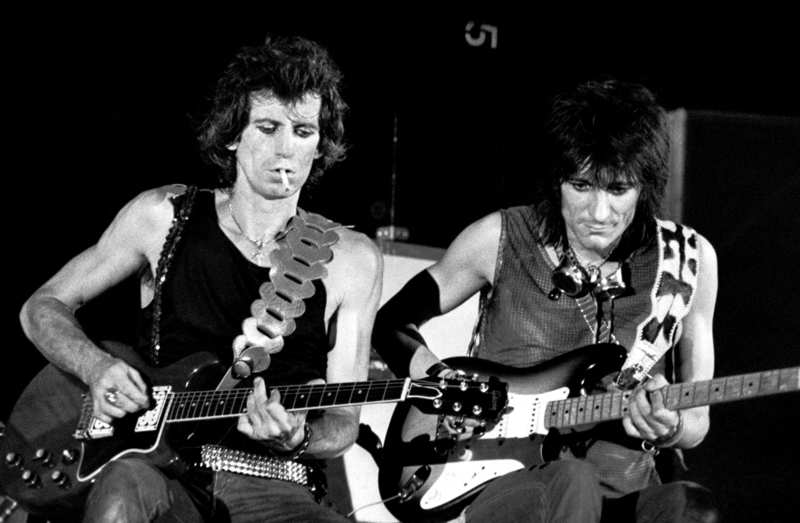 They got inspired by the G.I.s and had themselves shaped surf boards in a boat factory. The second part that set the hare running were the two towns Essaouira and Taghazout which evolved into hippie strongholds 50 years ago. Even Jimi Hendrix and the Rolling Stones spent some time here. The eased atmosphere and the rad surf conditions got along very well and today the towns’ surroundings are surfers’ paradises. Perfectly suited for Surf Camp Morocco. So far events and competitions have been goods in short supply. But two years ago, the first WSL event in Morocco got put on the menu. The Anfaplace Pro in Casablanca is only a QS 1,500 but the biggest city in Morocco can draw on that. The competition takes place each year in September. Mikaela Green won the women’s tournament and Deivid Silva the men’s contest. Right before the WSL show, the most important Moroccon surf event happens at the in the same place: The Championnat du Maroc de Surf where the best local surfers struggle for the win. Maybe one of the locals can win one of the coveted Anfpaplace Pro wild cards. 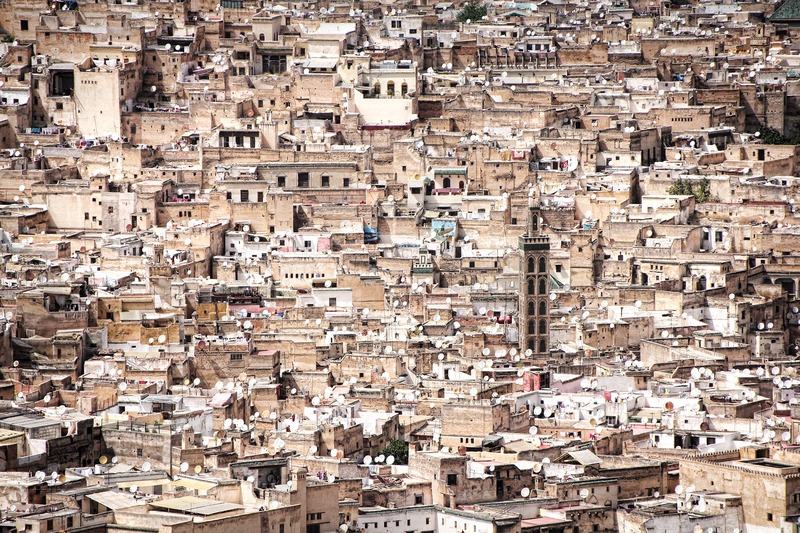 Morocco is currently Africa’s most popular travel destination. For one thing, this is associated with the country’s sheer beauty and a wonderful culture. For another thing, the political situation is stabile compared to many of Morocco’s neighbouring states. Other popular tourist destinations in North Africa had to suffer from heavy economical losses in the tourism sector due to the Arab Spring. The big changes didn’t affect Morocco severly compared to Egypt or Tunisia. The constitutional monarchy around King Mohammed VI. held on to power despite increasing protests. Especially this year new protest movements against unemployment and structural oppression came up and a ‘second’ Arab Spring could occur. Furthermore, Morocco has huge human right problems. Press freedom is extremely limited, trials aren’t fair in many cases, women face discrimination and homosexuality is still a criminal offence. Death penalty is still established by law but hasn’t been handed out since 1990. As a traveler, you probably won’t notice any of these difficulties. 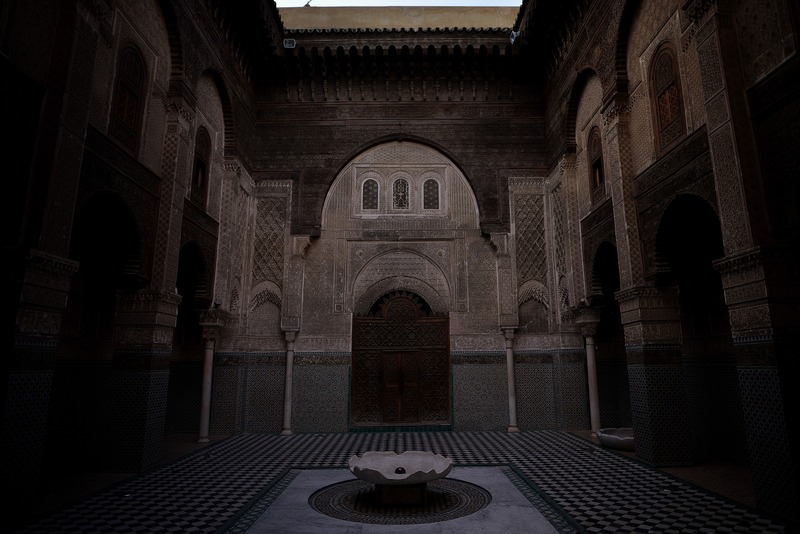 Tourists are treated excellently and the Moroccan hospitality and helpfulness has no rival. About 99% of the popoulation are Muslims. 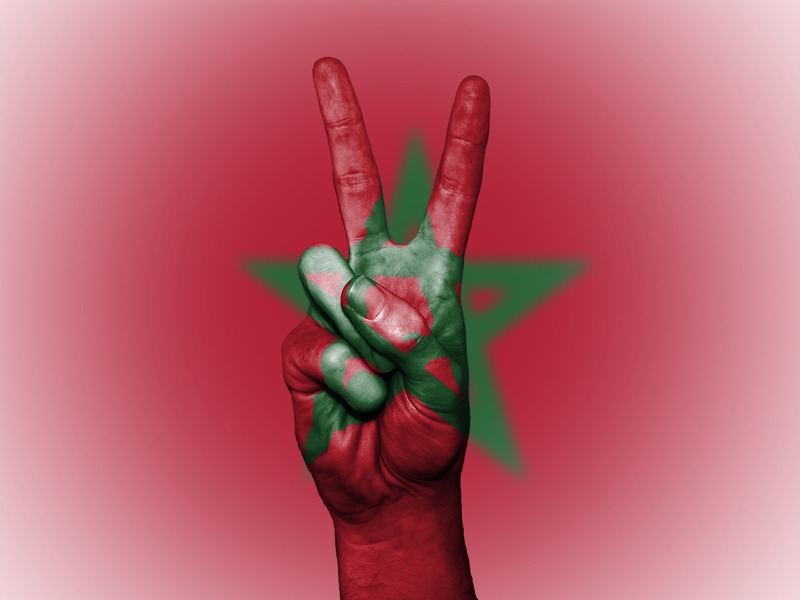 Almost every Moroccan speaks the Moroccan Arabic and additionally French that is used as a language in business, education and unofficially at work. The people who live in the touristic regions speak English as well. So don’t worry: You probably don’t have to use your broken school French around our Surf Camp Morocco. An important part of the Moroccan culture is music. 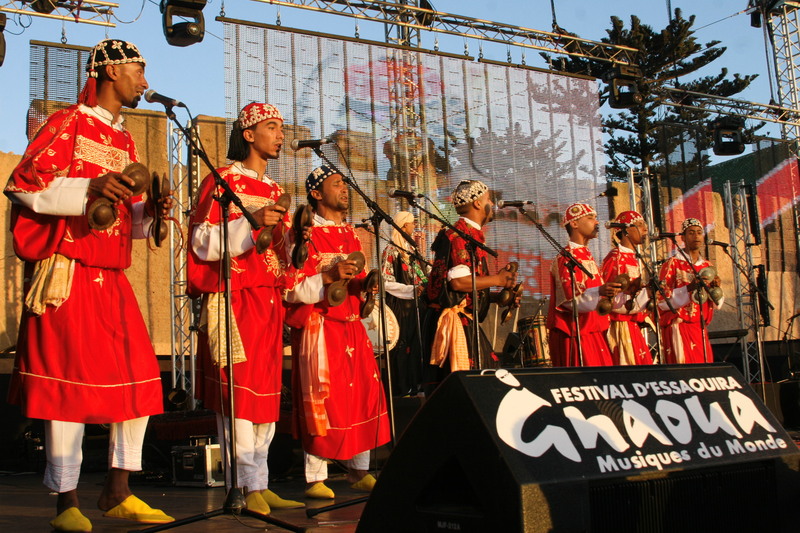 Every year’s highlight is the Gnaoua Festival in Essaouira where Arabic and international musicians come together and enchant the masses. 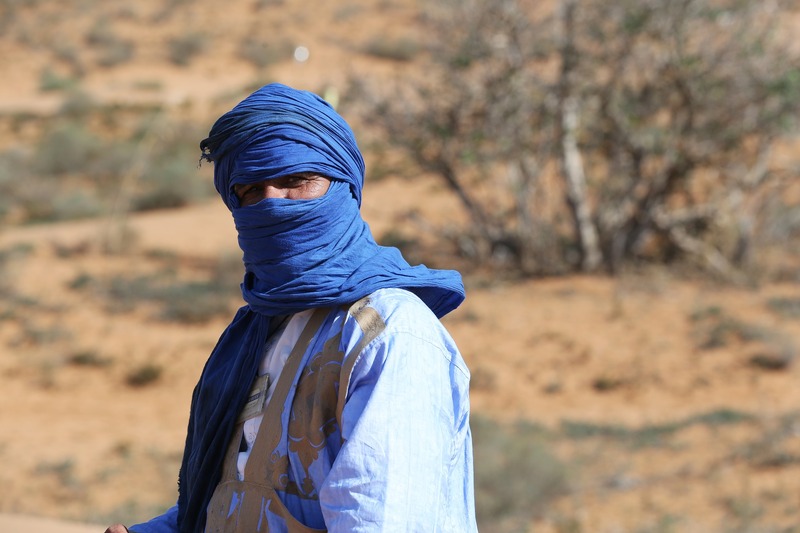 The Moroccan climate can be very diverse, depending on where you are. Generally, the country is warm and dry. In the North, conditions are more Mediterranean and the South and South-East are characterized by the desert which causes heat and drought. The climate on the Atlas Mountains is hot in summer and cold in winter. The humidity here is much higher than in other Moroccan regions. If you plan on a longer holiday in surf winter and only move near the coast, you should prepare yourself for any temperatures. The north offer 24 to 26 degrees in summer, at night the temperatures can drop 10 degrees down. The day temperature in winter is around 17 degrees and it rains much more frequently than in summer. The center and most of all the south is characterized by the Sahara outskirts. You should expect up to 45 degrees. Also the night doesn’t cool down too much like in the north. The water temperature in winter is much chillier than in sommer. It ranges between 15 and 23 degrees. The Mediterranean coast offers a warm water temperature in summer, the Atlantic is warmer in winter. Again: Winter? Surf Camp Morocco! Let’s start with a Moroccan classic. 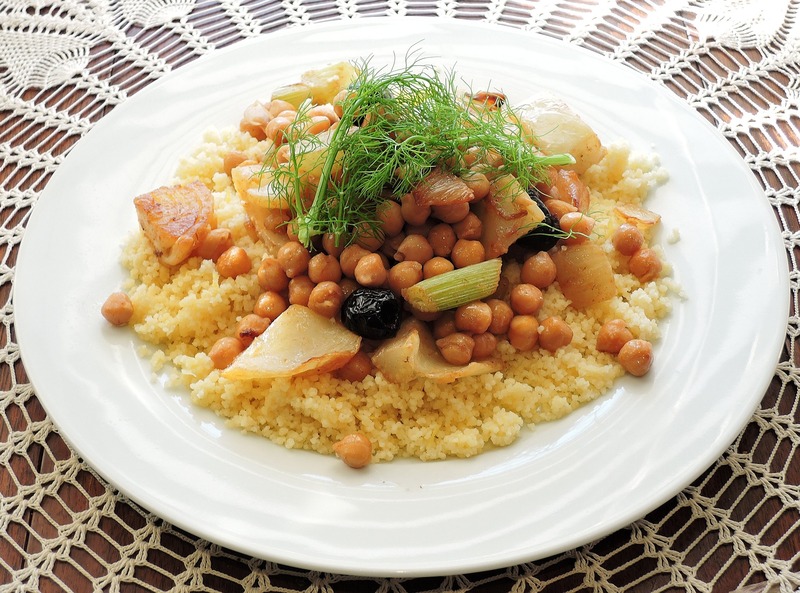 You won’t get around the famous Tajine. It’s cooked in a conical crock. 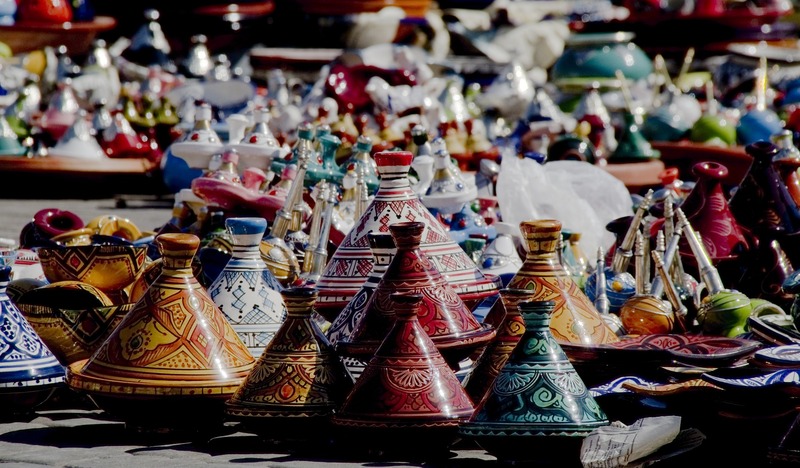 You will find as many types of Tajines as towns in Morocco. Popular ingredients are lamb meat, beef, chicken, different vegetables and we recommend also the delicious vegetarian versions. Also fruity savory creations with plums, dates and quinces are amazing. The semolina has finally arrived in the European households. Still, even ingrained couscous hipsters will get to know a completely new taste adventure in Morocco. 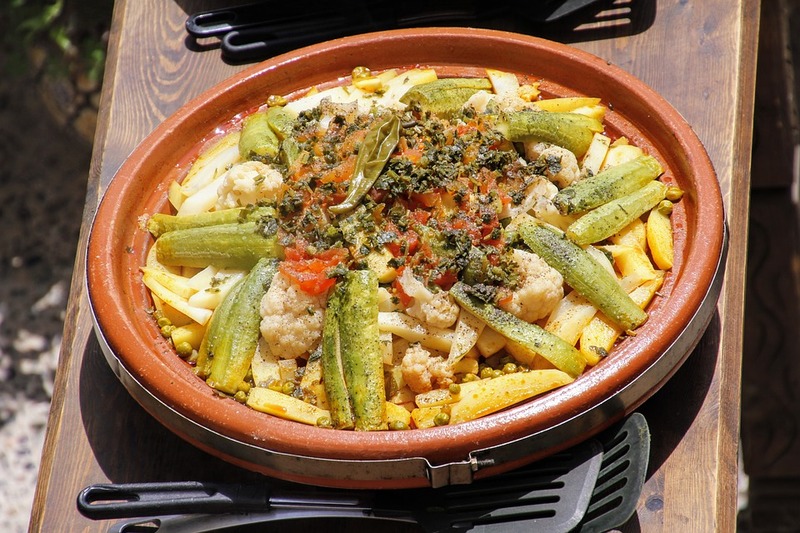 The Friday dish gets prepared with all kinds of vegetables like zucchini, tomatoes, chickpeas, carrots and also meat and fish species are classic ingredients. 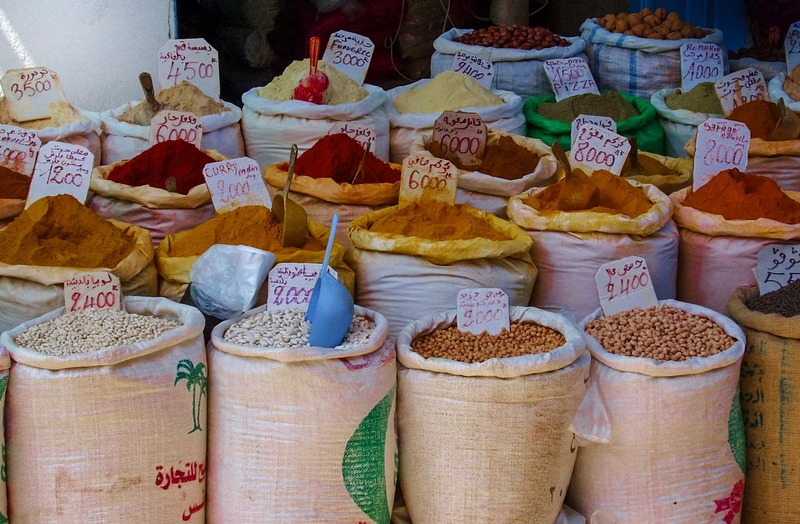 Some call Morocco the ‘Land of Spices’. Stroll around Essaouria’s alleys or visit the big markets in Marakesh und you’re gonna smell odours that are unfamiliar but somehow appealing. The most typical spice in the Moroccan cuisine is cumin. 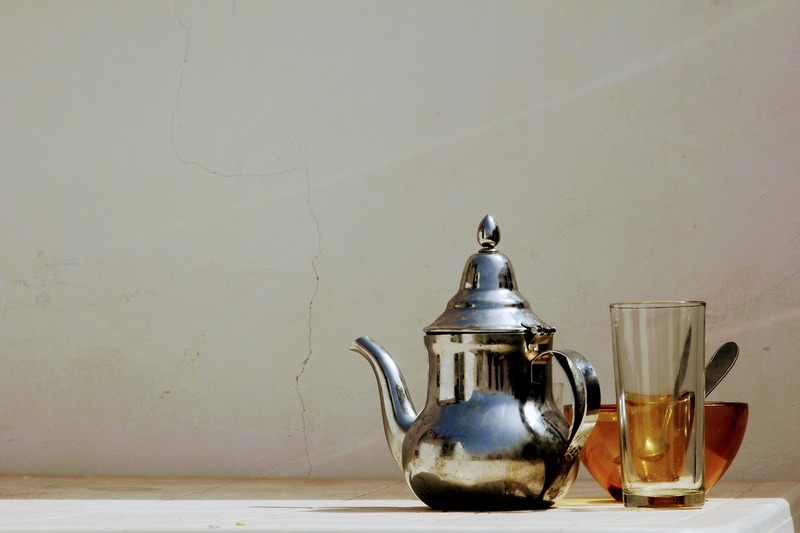 The Moroccan mint is called Nana and is undoubtedly the national drink. It gets cultivated and harvested in the Mediterranean north because not a lot grows in the dry south. People drink mint tea at every time of the day and at each instant. How about a fresh breakfast tea in the surf house before hitting the waves. Fruits are part of many main courses so it’s not surprising that the dessert contains fruits as well. 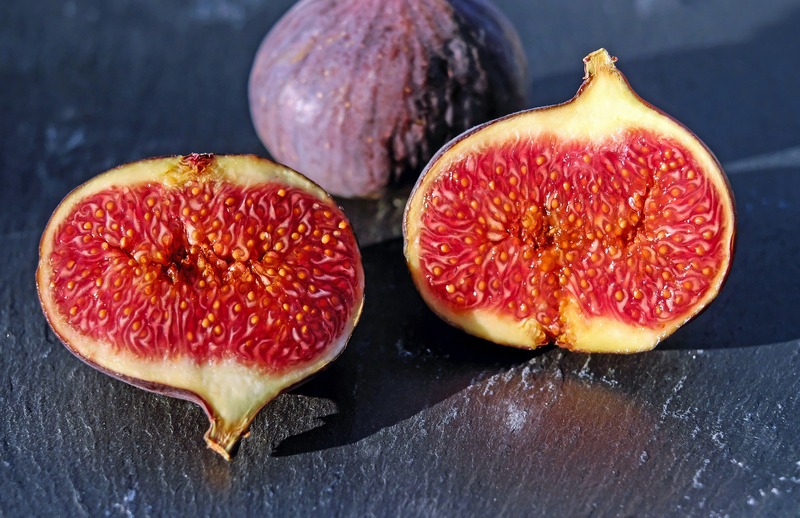 Dates, agaves, figs, peaches, bananas and more fruits grow in Morocco. They are served crude or within a yogurt dessert. The Moroccans also love to start the day with a dish full of fresh fruits. In the chapter about the Moroccan culture we already gave you a rough understanding of the Gnaoua Festival in Essaouira. Next year’s festival happens from 21th to 24th June. Moroccan folklore music gets mixed with US-American Jazz and European music. The result is a unique atmosphere that you haven’t experienced yet. Essaouira is always worth a visit anyway. Here we are. Surrounded by high walls and rambling about the narrow alleys, unfamiliar odours are in the air and men with creepy capuchins scurry around. What sounds intimidating, is actually the exact opposite. The narrow alleys are gorgeous, colorful doors look inviting and the men in their ‘Djellaba’, the capuchins, give us a friendly smile. 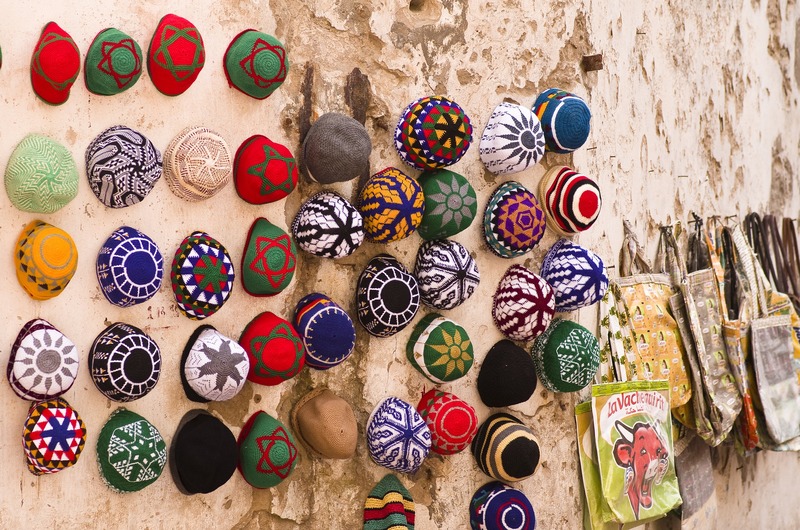 Essaouira is beautiful, colorful and hospitable. 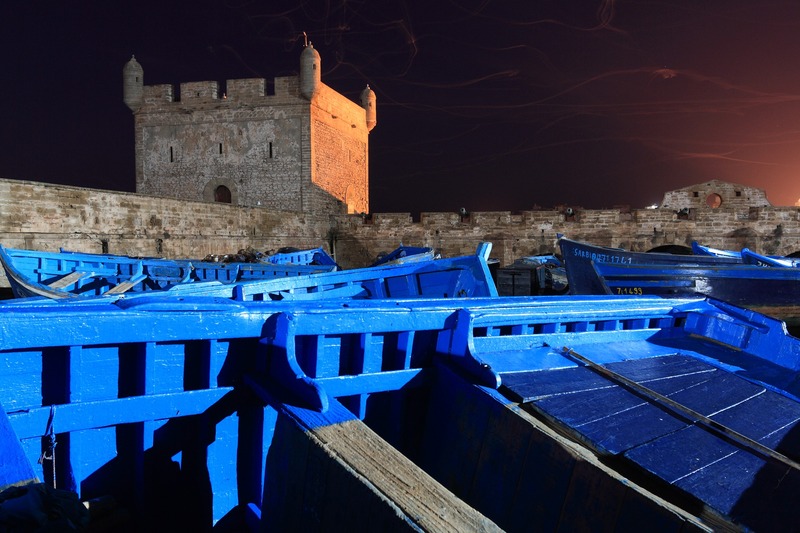 There’s no Morocco trip without a visit of the old fortress city! Also some Game of Thrones scenes got shot here. 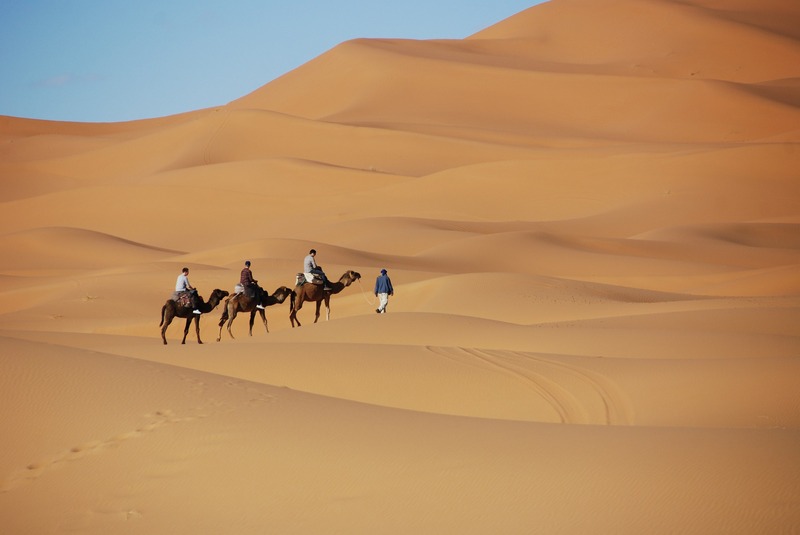 The great desert in North Africa has its most western outskirts in Morocco. For this reason you can catch the big swell in the morning and get carried through the desert on the back of a camel. Witnessing a sunset behind the gentle shapes of the sand dunes is an unforgettable event. 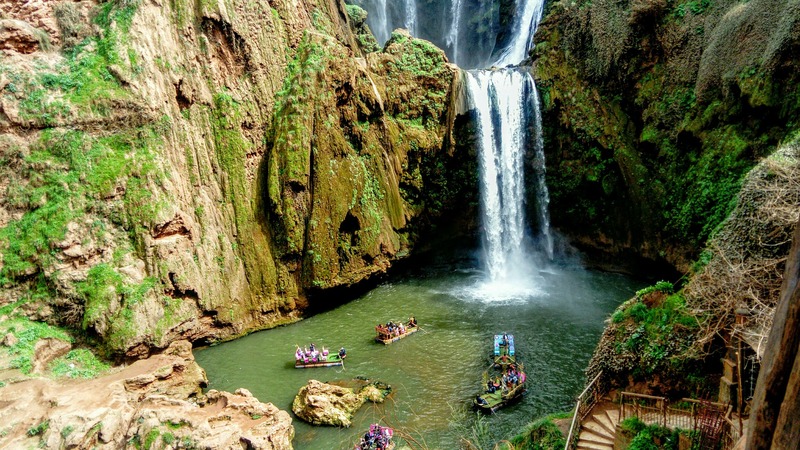 The gorge is situated in the Atlas Mountains. The term which describes the natural spectacle would be ‘enormous’. The scarps are so steep and the roads so narrow that almost no sunlight sheds inside the gorges. A small river crosses here right next to the road. Outside the gorges, you will see antique Kasbahs, strongholds which doesn’t contrast with the brown landscape. The Jardin Majorelle is the botanic garden in Marakesh and is believed to be one of the most beautiful gardens in the world. 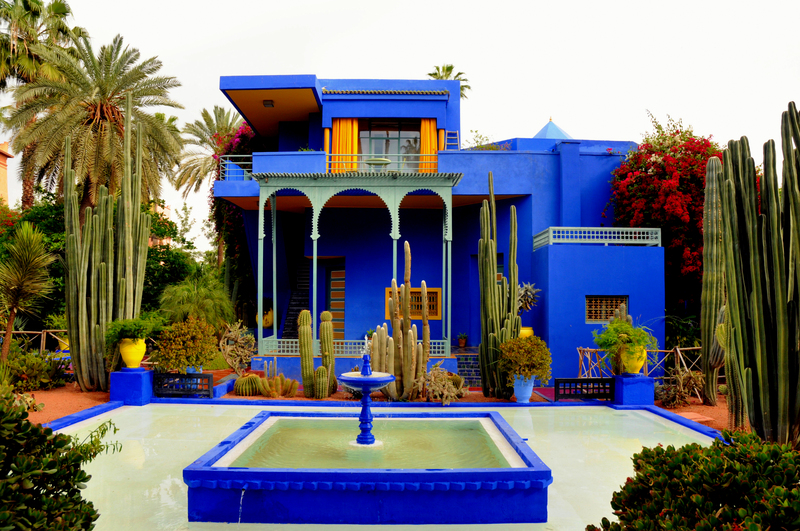 Jacques Majorelle, a French painter made the garden in 1923 and brought plants from all over the world. After his death, the garden escaped for several years until the famous fashion designer Yves Saint Laurent and his partner Pierre Bergé bought the property and this is how it looks today: A small, quite place in a big, loud city. Looks like a fantasy of paradise. 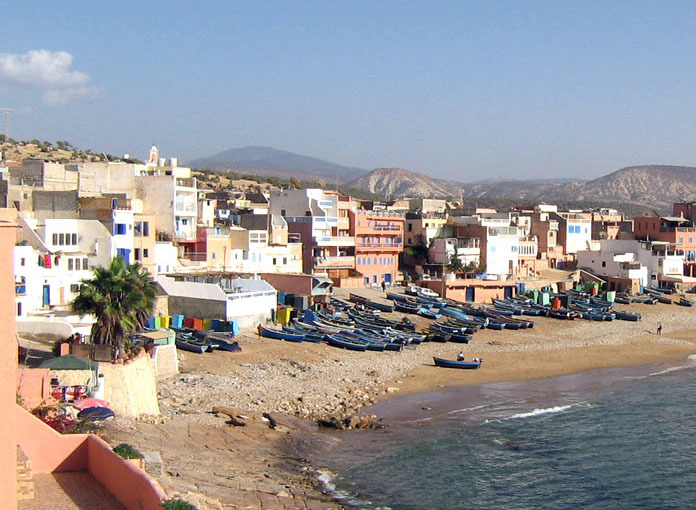 Although the WSL holds the QS in Casablanca and Essaouira is the hotter place – when it comes to surfing, no place in Morocco can keep up with the small fisher village Taghazout. The amazing surf vibes attract not only experienced surfers but also beginners that learn surfing in at Surf Camp Morocco for the first time. The beautiful spots ‘Killers’, ‘Hashpoint’, ‘Mysteries’ and all the other top-class spots want to get surfed. Hollywood flair in the middle of the desert. Almost every time when Morocco functions as a movie set, the Atlas Corporation Studios in Ouarzazate are involved. Movies like Alexander, Gladiator, Asterix and Obelix and also Game of Thrones were filmed here. 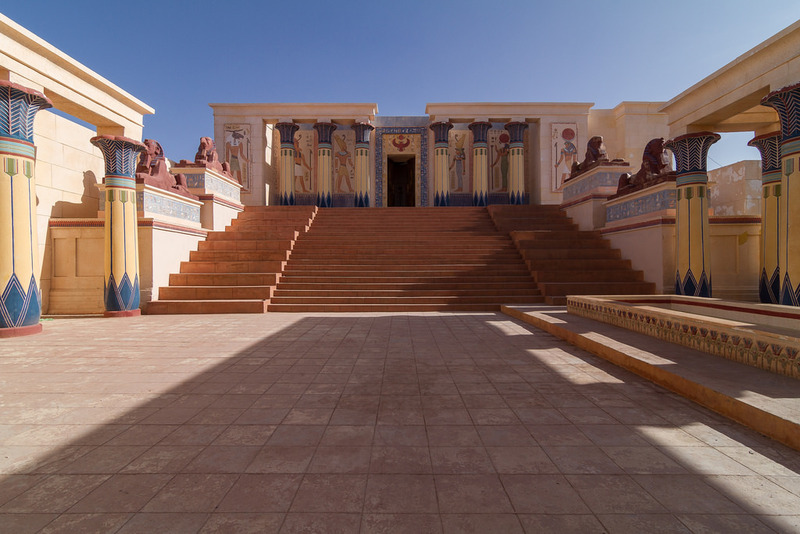 The area still has no modern architecture so it’s quite simple for the production designers to go back in time and revive the old Egyptians and Romans. 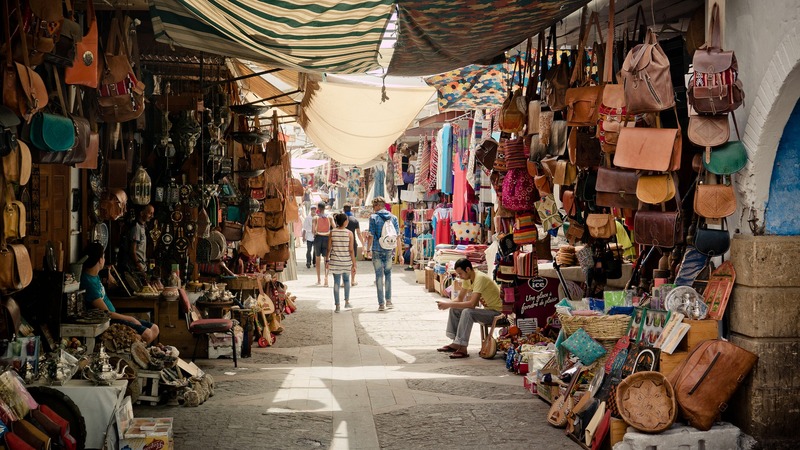 Souk – that’s how the big markets in Morocco are called. The biggest ones are in the metropolis Marrakesh. What attracts immediate attention is the color variety. Wheter cloths, dresses, lamps or spices – it seems that you find every color of the rainbow here. Sellers shout, advertise their goods and as a visitor you don’t know where to look first. 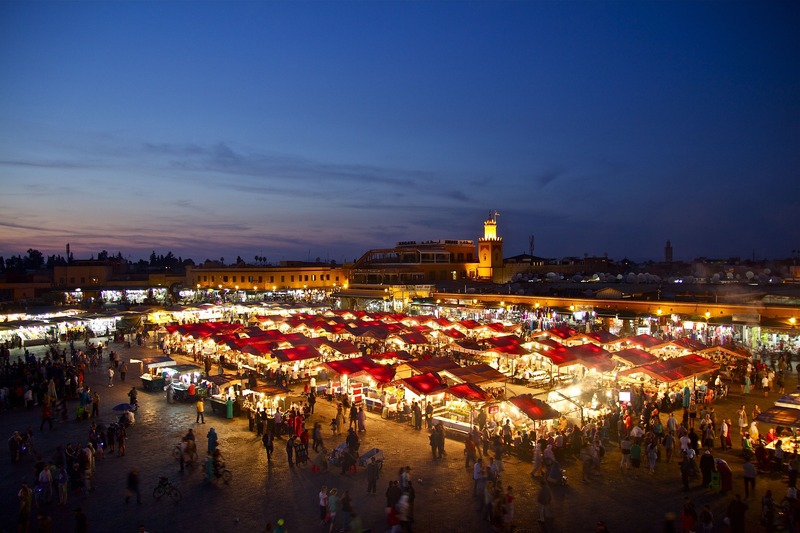 The markets can be very hectic but still, a visit of Marrakesh’s markets is an obligation. 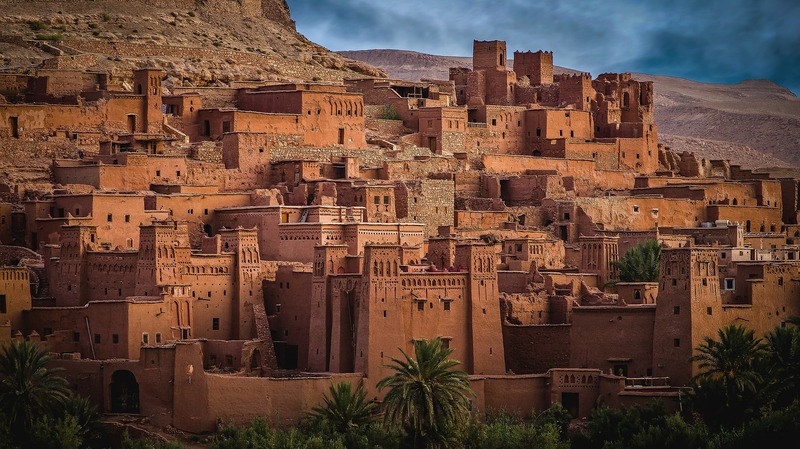 Zagora is the center of Draa Valley, an oasis landscape that seems to be arisen from a storybook. You will experience a heavy contrast on the trip to the valley. 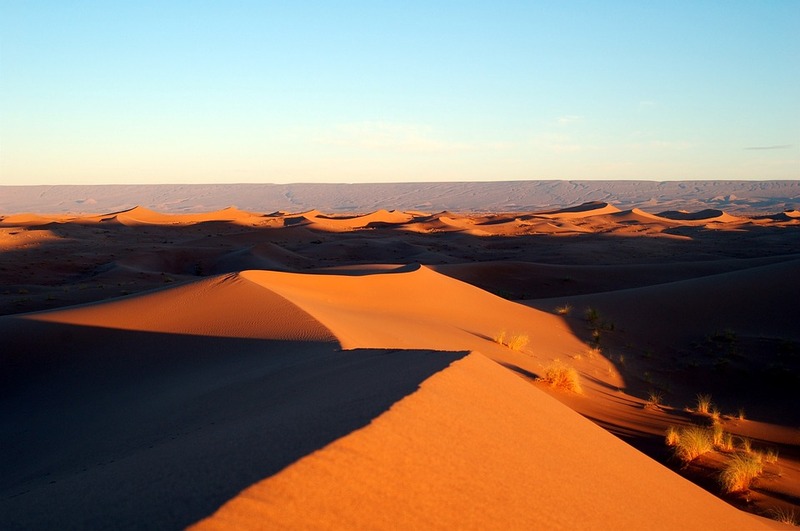 Normally, Morocco is extremely dry and arid. 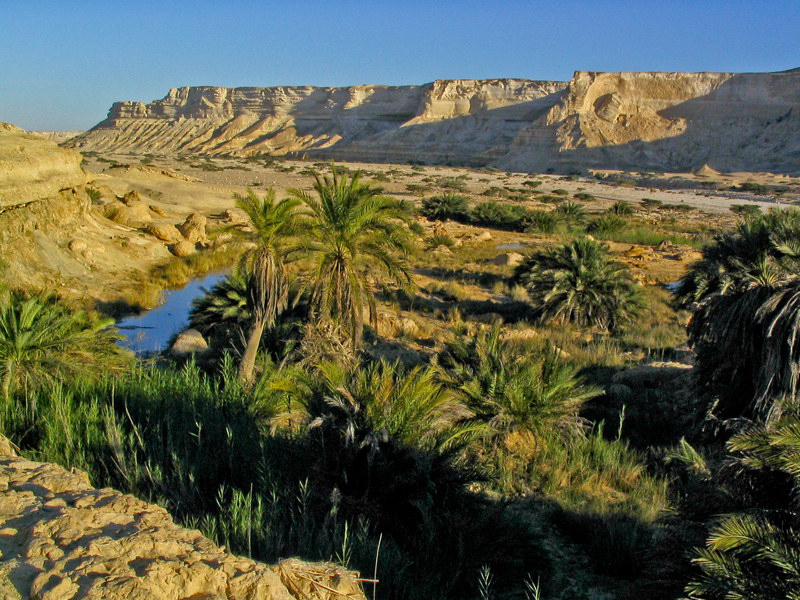 The contrast between desert and the green nature of Draa Valley offers a great adventure. The blue city. 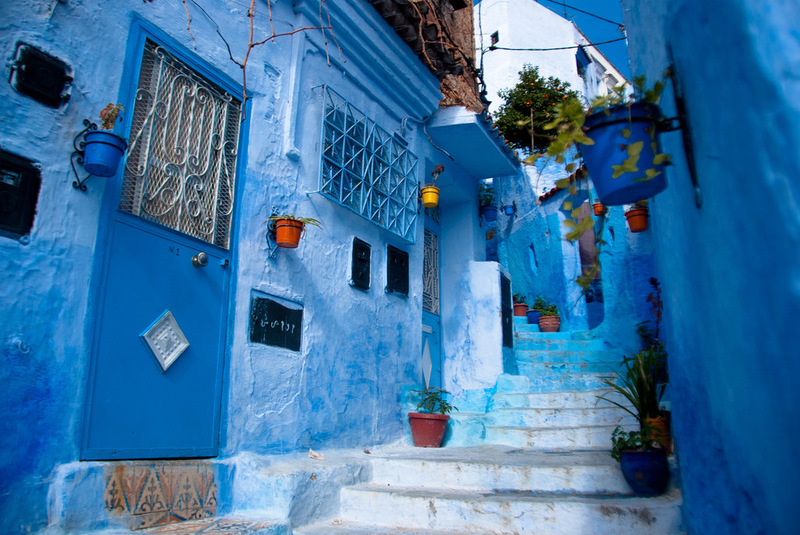 Chefchaouen is a real masterpiece. A big part of the northern city is painted with a luminous blue color which purpose is to keep away black looks. What it really causes: Attracting marveling glances from thousands of travelers. Chefchaouen is also famous for the large cannabis plantations in the immediate hinterland so the illegal cannabis commerce is booming. Why Morocco with Planet Surfcamps? Classic: Surf season in Europe is over but you’re far from being tired of the wonderful breaks in France, Spain and Portugal. Surf camp feeling, the waves, warm sun.. It’s simply too early to go home where frost and rain await you. The easy solution to this problem is called Morocco which is only 13,5 km away from the European continent (Strait of Gibraltar). The big difference: Morocco is still warm in wintertime and the waves are then at their best. Beneath ideal conditions as a winter travel destination, the oriental culture attracts visitors with colorful markets, interesting odors and friendly people. Winter is coming – Surf Camp Morocco calling!